Gray Fox will not only market your home but as a Full Service Brokerage, will be with you each step of the way, from professional marketing to the closing table. Thanks to technology and streamlined processes, Gray Fox can offer you a flat fee marketing agreement for $995* and let you keep the equity that you have earned right where it belongs, in YOUR pocket. 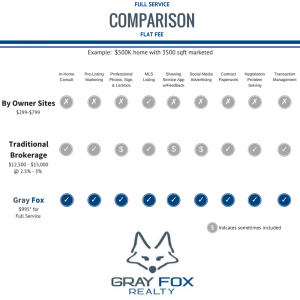 *Gray Fox Realty does have a 2 tier fee structure. $1495 for larger homes over 4000 sqft. At closing the seller is responsible for a 3% Buyer’s Agent commission and a $395 administrative fee. As a Full Service Brokerage, Gray Fox will market your home and will be with you each step of the way, from professional marketing to the closing table as this video below shows. Fee Structure is $995 for homes under 4000 sqft, $1495 for homes over 4000 sqft. Seller is responsible at closing for a 3% buyer’s agent commission and a $395 Admin Fee. Gray Fox Realty is built to save you thousands of dollars in listing side commissions while offering superior full service and results. Why pay more? Gray Fox will provide you with superior service and results. The scenario above shows you a savings of $11,505 to $14,005 on your listing side commission. Prior to signing any agreement, we want to meet you and make sure that our model aligns with your goals. Gray Fox will also share with you the market trends. The Gray Fox yard sign utilizes a bright background with soothing colors and of course Gray, the fox, is prominently displayed on the sign making a lasting impression with prospective buyers. They will remember Gray and therefore remember your home. Social Media blasts will be engaging to the buyers even those that are just casually shopping. Price adjustments can be added to the social media blasts and traffic is driven directly to a single property website selling only your home. Gray Fox has years of experience negotiating real estate contracts. We work diligently for you during negotiations whether buying or selling your home. Gray Fox takes the security of your family and home seriously, therefore we only use NAR (National Association of REALTORS) approved Sentrilock lockboxes. Never will Gray Fox use a combo lock on an occupied home. Gray Fox Realty will construct teaser marketing specifically for your home. This includes social media advertising to highlight when the first showings can be scheduled and will generate a buzz for your home. Gray Fox Realty makes showing your home convenient and safe. You are in control of your showings at all times with minimal effort confirming appointments by phone, text, or email. You can rest easy knowing that our systems and process management are at work on the sale of your home. Our systems will ensure that the stipulations of the purchase agreement are being strictly adhered to. Gray Fox only utilizes professional photos in the marketing of your home. We know that 51% of buyers find their home online. Our high quality marketing will be the first impression of your home. We understand that the online presence is the new curb appeal. Prospective buyers and nosy neighbors, can learn about your home with Gray Fox Realty’s text capture yard sign. Anyone with a smartphone can instantly get access to photos and details of your home. Gray Fox makes it easy for you to review and sign contracts. You can sign offers anywhere anytime on your smartphone, tablet, or desktop device. With the unique Gray Fox selling system you will save thousands of dollars in listing commission. Gray Fox lists your home for a flat fee of $995* where other agents typically charge 2.5% to 3% or more for the listing side commission. Therefore you get to Keep The Equity. How do most owners market their own homes? FSBO (For Sale By Owner) homes don’t sell for as much money nor do the they typically sell in the sellers desired timeframe. Gray Fox is different, they have a set of proven marketing tools at their disposal. Gray Fox will get to work marketing your home right after your in home consultation. We used Mike to help us procure the lot and build the new home in Falls Grove. Mike was outstanding on the project management side. Without Mike the house would nave not turned out this way. I strongly recommend you use Mike as your real estate agent. We were relocating from St. Louis to the Franklin area. Didn’t know the area at all and we found Joey, and he’s been fantastic. Went above and beyond his call of duty in every single way, and we’ve bought and sold three houses now — worked with a lot of different realtors and he’s by far and away the best we’ve ever worked with. So, highly recommended — anybody either living in Franklin or relocating. He’s been fantastic. I just want to thank Joey McCloskey for being the agent on the sale of our house. Everything went super smooth. He’s very responsive — sold the house in record time, even before it was officially on the market. Couldn’t have asked for a better agent. I highly recommend Joey, and for every other house purchase or sale I certainly will be using Joey McCloskey. Thank you very much. You made the process very easy and painless, and couldn’t have asked for a better REALTOR. Joey McCloskey helped us find a home. We’re moving from Johnson City to Franklin in Williamson County and we found a great home and we’re so grateful. Thank you so much, Joey McCloskey. We love you!